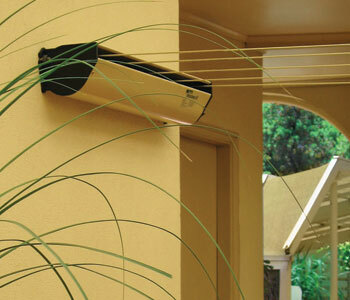 The Austral Retract Away is a discreet retractable clothes line suitable for use in many different areas. The Retract Away is suitable for carports, garages, balconies, laundries or long narrow areas. When fully extended the Retract Away will hold almost as much washing as a medium sized Rotary clothes line. The Austral Retract Away Clothes Line is the only retractable that will lock in from as little as 2mts in length and extend up to 8m (or 10m) in length, making it the longest Retract Away available. The Retract Away is easily retracted back into the cabinet when you have finished using it. The Retract Away may be installed from wall to wall; wall to post, post to wall or post to post. Surfmist, Heritage Green, Black & White.